FARMINGTON - Mt. Blue Rec. 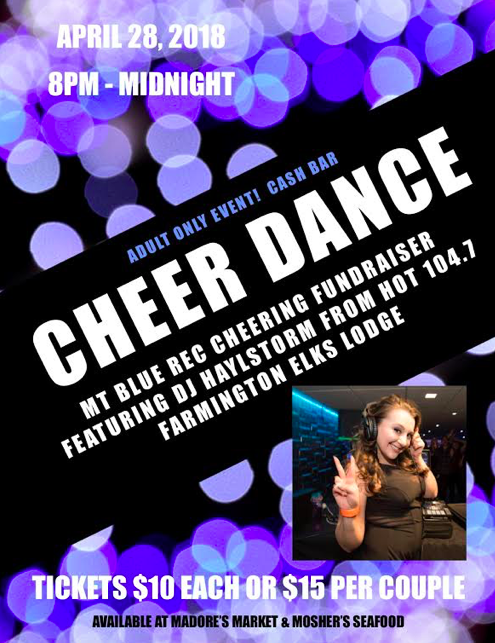 Cheering will be hosting a fundraising dance at the Farmington Elks Lodge on April 28 from 8 p.m. to midnight. Cash Bar and DJ Haylstorm from HOT 104.7 will be playing a variety of music to dance to. Tickets are $10 each or $15 per couple and must be purchased in advance. 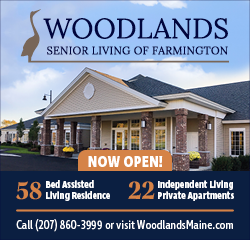 Tickets will be available at Madore’s Market and Mosher’s Seafood. This is an Adult Only event. For more information please email mtbluereccheering@gmail.com. I don't understand having a fundraising event for cheering that students can't be involved in. It's unfortunate they are hosting this the same night as the Children's Task Force Dance that has been publicized for awhile now. With the constant Rec Cheering fundraisers they have been doing it seems they are asking a lot of the community. I agree with "Bec" a family dance that could have involved the cheerleaders would be more suitable. Sorry that you feel this way. Our parents, coaches, and board have worked very hard all season VOLUNTEERING their time for the boys and girls in the program. This will be a night out for the parents after a long cheer season. The program is working hard to supply the kids with much needed equipment and new uniforms (the fundraising efforts thus far have been able to cover only half of the needed uniform cost not to mention the cost of equipment) As to the scheduling, it was unfortunate. We didn't know that it was the same night at the task force dance, and it wasn't until after we started publicizing and had the hall and dj booked that we learned of the conflict. The Children's Task Force is an important organization and it certainly wasn't a planned conflict. Parent, Correction, new uniforms were not purchased last year. Uniforms had been used for 4 plus years and we started a 5th year (this year with them). New uniforms were not purchased until January as we had to raise the funds to do so. The cost of running the program has also increased, things like music licensing for example. Ultimately you are correct, it is about the cheerleaders! Have a great day! The Rec Cheering board volunteers their endless time and energy into this program at no cost. They love our children and cheerleaders and the program. If they were not here for the program in the interest of our children, we would not have a program at all. Trust me, they do not do this because it's always fun. Especially when dealing with negative people. This is supposed to be a positive fundraising effort. If you do not wish to attend the dance, just scroll on by. No negative comments are necessary. Being as I’m extremely direct and you obviously have some very inaccurate information, my suggestion to you (or anyone) would be to contact us at our email address mtbluereccheering@gmail.com and we would be happy to set up a meeting with you to explain exactly how we run our program and just how much we are truly dedicated to these kids and where these funds go. We look forward to hearing from you.